An HVAC technician usually wears a tool belt on the job site. Choosing a tool belt is an important decision because the technician will be wearing it all day every work day. 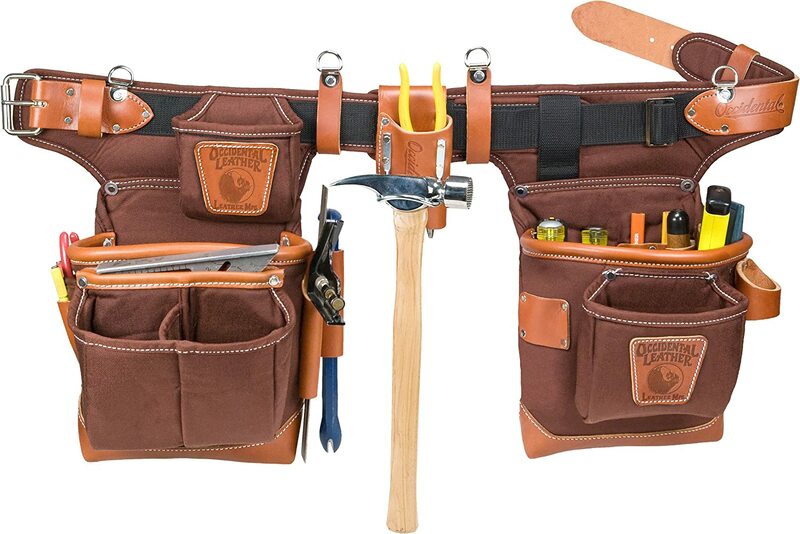 You should choose a tool belt that has a comfort fit and has enough compartments to hold the essentials. If you are working upstairs in the attic or crawling in a crawl space under a home, a tool bag with a carry handle is a must. You don’t want to spill your tools out of a tool belt when you are crawling in a narrow crawl space. Lightweight tool belts are best for routine maintenance calls for servicing thermostats or changing filters. We have found a selection for you to check out. Choosing one is a matter of personal taste. We recommend that you check out our favorites as we have reviewed and provided links to the best of the tool belts available in 2017. This is a tool bag that is designed for carpenters, but HVAC technicians can make good use of it. It is made of leather to be wear-resistant. It features 24 pockets and tool holders. The main bags are ten inches deep and are designed to hold the tools of the trade. This tool bag weighs just five pounds and is an American-made product. With this tool bag set, you won’t need the suspenders to hold it in place. The fit on the hips does not create pressure points or discomfort. This tool bag set is durable and will stand up to everyday wear. This tool belt is also designed for electricians, and HVAC technicians can wear this tool belt and change out a defective breaker. This tool belt weighs in at 4.5 pounds. It is durable and ventilated to prevent excessive sweating at the beltline. The carry handles make it easy to put the belt on and take it off. This tool belt features 27 pockets for smaller tools and 9 larger pockets. The main complaint is that there is not a cover-over a couple of the pockets to keep small items from spilling out of the pockets. You might want to consider getting the suspenders to attach to this particular tool belt. Also, this belt is made for thin waists. Weighing 5 pounds, this product is made in the USA. It has models made for both the right-handed and the left-handed wearer. This tool belt is made of nylon with leather accents and has additional suspenders that help reduce injury to the lower back. It is a functional tool belt that is durable. It is a high-quality product. This tool belt features 10-inch deep nylon bags. The bags have reinforced leather bottoms and corners. This tool belt is versatile and can be used when carrying tools up the ladder into the attic or for routine maintenance calls on the ground. This DEWALT tool belt is extremely lightweight. It weighs only 9.6 ounces. It is made in China. This tool belt is smaller than some, but it is perfect for those tools needed during routine maintenance HVAC calls. This tool belt is likely to become one of your favorites. 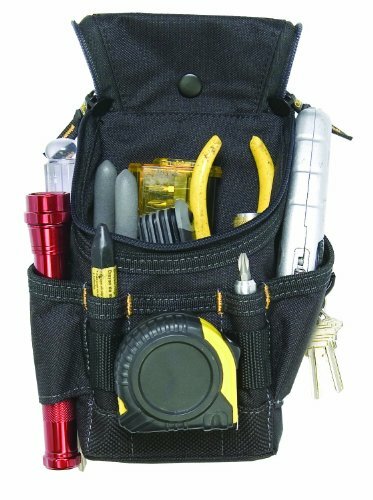 Pliers, screwdrivers, wire strippers, and HVAC gauges will fit nicely in this electrician’s pouch. 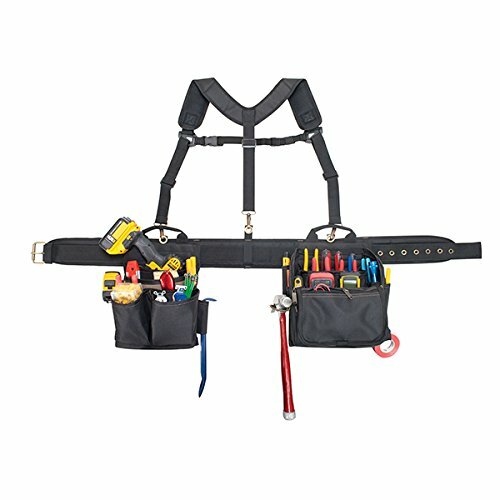 These items are used regularly and this handy tool belt will give you a hands-free way to transport them from the work-truck to the job site. This tool bag features a built-in cordless drill pocket and has a zippered top flap pouch to reduce tool spillage. This tool carrying set is designed with padded suspenders and does not place strain on the lower back or hips. It has a wide padded comfort belt to hold the tool bag in place. This tool bag rigging is made of polyester fabric. It has a combination of 29 pockets, sleeves, and loops. It is a bit heavier than the other models, as it weighs in at 5.1 pounds. It is manufactured in China. This is a bulkier tool bag, and the chief complaint is that it is oversized and the material frays. However, if you are looking for a tool bag that does not depend on your lower back to carry it, this should be your first choice. If you prefer a tool pouch, we know the number of options can be intimidating. To help you make a choice, here are some reviews of the ones we like best. Of course, you’ll have to decide what works best in your case! Occidental Leather offers another handcrafted leather product designed specifically for journeyman electricians. The leather beats the polyester product hands down for durability. 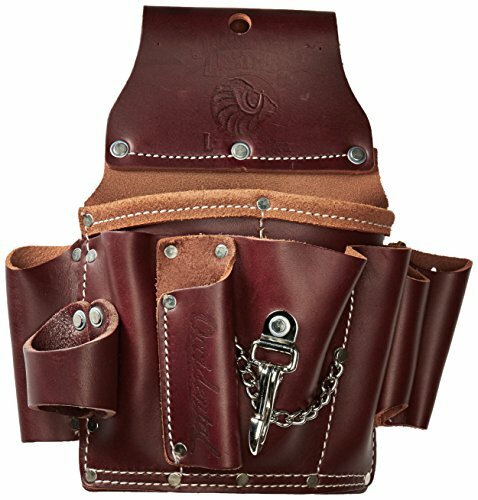 Tools can’t poke holes through the leather, and you won’t find a need to replace this tool pouch. This product is a good choice for HVAC techs who are working on the electrical issues of a unit. This tool pouch weighs 1.9 pounds. It has a handle and makes it easy for carrying into the attic or under the house in a crawl space. 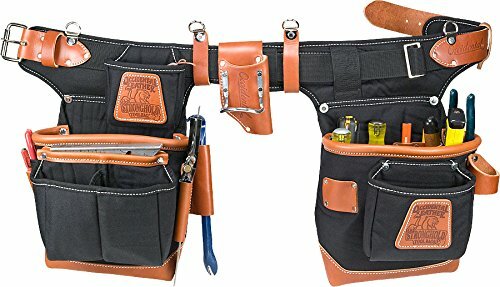 This tool pouch holds the wire strippers, nut drivers, lineman’s pliers, and multiple screwdrivers. It also holds wire nuts, electrical tape, and other essentials. When you are buying tools, you buy the quality tools that will last, and when you purchase a tool pouch you should purchase the highest quality product as well. The Occidental Leather products are more expensive, but they are a high-quality product and worth the extra expense. This a lightweight tool pouch weighs only 5. 6 ounces. It has seven pockets. This product is manufactured in China. 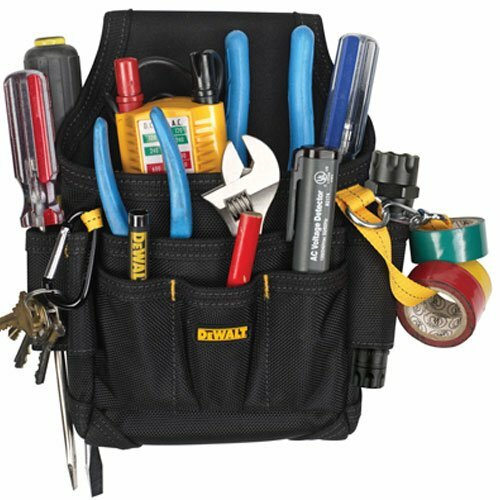 This tool pouch can be used for specific routine maintenance HVAC calls. It is not very durable and you can expect to replace this if you are not careful with it. The stitching on the edge of the material is too close to the edge, and it frays and rips quickly. Poor quality is the chief complaint with this product. Users report that the zipper and seam came apart during the first use. HVAC work is rugged, and this product would likely not make it through one day on the job. If you are using this product only when checking out the thermostat or to change filters, you might be pleased with the product. 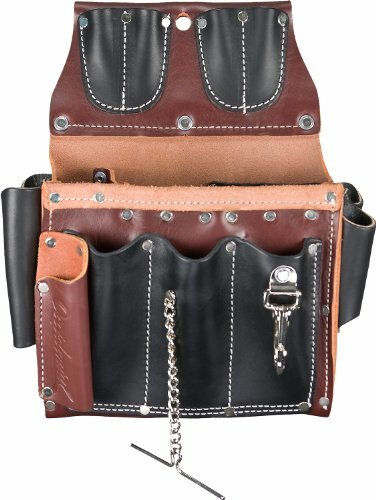 Attic or crawl space calls would be too rough for this tool pouch. This one of the best tool pouches that we found on the market. It is heavy-duty and made of all leather. 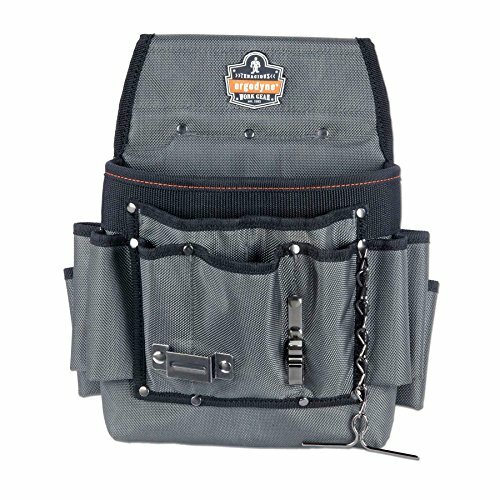 It sports 15 pockets and tool holders for your worksite essentials. It even has a loop for a flashlight for peering into the dark crevices under the floor or into the attics. A chain for electrical tape is another unique feature that we like. It is a lightweight tool pouch, weighing in at a scant 2 pounds. This leather product is American crafted and built to last. This product is a bit pricey, but it is worth every penny! It is a solid product and has a comfort fit. This tool pouch is equipped with 13 pockets made of polyester. It is split into two large pockets, five smaller pockets, and six large slots designed to hold screwdrivers. This tool pouch weighs in at 1.1 pounds so that you are not lugging around a lot of extra weight with your tools. This polyester product is reinforced with polypropylene to withstand the abrasions that come with a hard day’s work. If you load it with tools, there is a possibility that the stitching in the back pocket will tear because it is not as durable as leather. However, this tool pouch is serviceable for routine HVAC maintenance calls. If you are going up into the attic, you might want to choose a leather product rather than this one made of polyester. You don’t want to risk the polyester ripping while you are climbing up or down a ladder or dealing with insulation in an attic. This is a medium-weight pouch at 1.6 pounds. It is made in China. This is likely made of faux leather. It is not as high quality as the Occidental Leather pouch, but this particular pouch is reinforced with rivets to increase its durability. One of the unique features of this pouch is the “T” chain tape clip. You will need to buy either the suspenders or a belt to go with this pouch if you want to wear it. If you want to use this as a carry tool pouch, you will be pleased with this product. We recommend oiling it with baby oil to soften the faux leather. This product will last longer than the polyester or cloth tool bags, and it will survive the average days on the job site. This product is not durable enough for long-term everyday use heavily loaded with the essential HVAC tools. Choosing your tool belt wisely will make you a more efficient HVAC technician. As a heating and air technician, carrying tools from the truck to the job site is a many-times-per-day activity. One of the most important tools of the trade is the tool belt. If the tool belt malfunctions or spills your tools all over the ground, you will be spending valuable time retrieving your tools and going back and forth to the truck instead of focusing on the task at hand. Rather than wasting time returning to the truck, you will have your favorite tools within reach at your waist. This will improve your productivity and make your boss and your clients happier because the job will be finished quickly and efficiently. 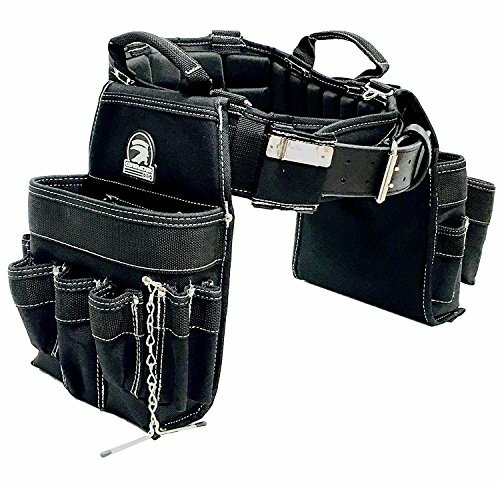 For those who are working on the routine maintenance calls on the ground, these tool belts come in handy, but for the technician working in the attic or crawling in a crawl space under a home, these tool belts are cumbersome and inefficient. The tool bags that have the carry handle are the best choice because they can be carried in your hand rather than worn into the narrow, confining spaces. 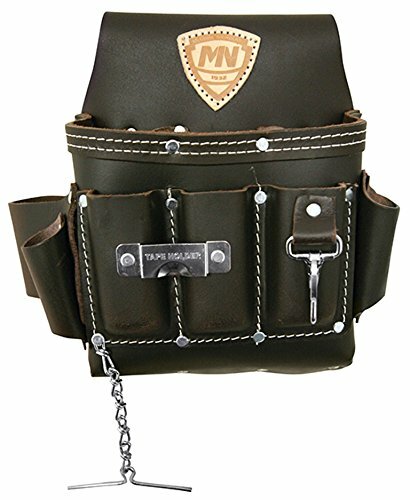 Tool belts and tool pouches come in many shapes, sizes, and varieties. Like a woman’s purse or a man’s wallet, the tool belt or tool pouch is chosen based on personal taste and style. Whether you choose the low-slung tool belt, the over-the-shoulder suspender style, or the bag with the carry handle, you must be comfortable with your choice because you will be using it all-day, every day. Material and appearance are just two of the things you should consider when you are selecting a tool bag or tool pouch. You should also consider where you will be using it. The carry handle bag will serve HVAC technicians better in the attics and crawl spaces while the low slung tool belt resting on the hips would be better suited to the outdoor service calls. The routine maintenance calls would require a smaller tool pouch with limited space for the specialty tools of the HVAC trade. No matter which type call you are working, you should have your tools organized and prepacked into your bag, pouch, or tool belt. An organized HVAC technician is efficient and happier on the worksite.